Now, beer drinkers don’t bat an eye at a cloudy IPA—in fact, every brewery from Vermont to Washington state seems to be chasing the haze craze. Brewers have increasingly been enamored with dry-hopping, the process of adding hops to the beer after the boil phase of brewing, which results in more aromatic and flavor compounds and less bitterness. That causes some hop particles to remain in the beer, turning it a bit hazy. Many brewers are also choosing not to filter their IPAs, leaving suspended particulates in the beer that consumers have come to associate with more hop flavor. And so, in 2018, even the venerable Sierra Nevada cannot resist hazy IPAs’ siren song. The recent release of unfiltered, “modestly bitter” Hazy Little Thing left me—to borrow a phrase from the kids—shook. Sierra Nevada Pale Ale is one of my favorite beers of all time, and I still rotate it into my fridge every few weeks to remind me what a pale ale should taste like—flavorful, balanced, precise. Sierra Nevada’s Hop Hunter is a more recent debut from the brewery, but it’s also a beer I’ve enjoyed for its clean bitterness. Both of these are studies in clarity. So, what does a classic Sierra Nevada fan think of this new 6.7 percent ABV yearround release? Drumroll please… it’s good. It’s a fine take on the less-bitter IPA trend that doesn’t taste muddy, but it also doesn’t seem like it’s quite in Sierra Nevada’s wheelhouse—or maybe I just can’t shake my affinity for the classics. Hazy Little Thing’s appearance is—shocker—quite hazy, such that I can only see a shadow of my hand moving behind the glass. But it has a pleasantly light gold luminosity capped by a fluffy, craggy, khaki-colored head. Aromas of pulpy orange juice and sugary lemon rind pop off the glass, with some mango and papaya skin that I’ll attribute to the Citra hops. A swirl brings out a pop of pink Starburst and orange rind, reminding me of Sierra Nevada’s Sidecar orange pale ale, if it was drinking a smoothie in Bermuda. That same mango skin and overripe grapefruit lead the sip. Sometimes high concentrations of Citra hops impart a fruity funk for me, and I get tons of that out of this beer. The tropical fruit notes slide into a sweet, white onion hop flavor at the close; the swallow finishes quietly, like a movie’s slow dissolve. I search for more beyond the mango and citrus, but come up short sip after sip. I can almost find a flash of lemon flavor (but not tartness), but it’s so faint. I would have loved a spearminty hop to punctuate the swallow and give the whole thing a mojito-like vibe, but no dice. The beer’s medium-full body is smooth and pleasant, though carbonation could be a touch higher to help the sip edge toward a finish. Overall, I’m being super nitpicky about this beer, but that’s because I come to Sierra Nevada beers from such a place of admiration. This new Hazy Little Thing is nothing to be ashamed of, for sure, but I can’t see myself ditching Pale Ale for it—even if that makes me one of the not-cool kids. 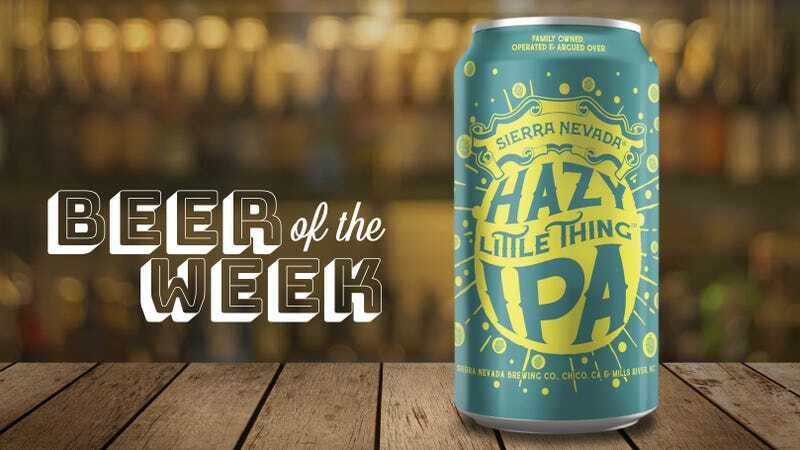 Hazy Little Thing is a yearround release available in all 50 states; check Sierra Nevada’s website for distribution near you.